‘Toy Trouble’ marks the return of Sniffles’s friend the bookworm, from ‘Sniffles and the Bookworm’ (1939) and ‘The Egg Collector’ (1940). This time the two friends snoop around in the toy collection of a department store. All goes well until the duo encounters a cat. Like Sniffles himself, the bookworm is more cute than funny, and like most Sniffles cartoons this short suffers from a terrible slowness. The result is a rather tiresome watch. Nevertheless, it contains a nice scene in which Sniffles hides in a row of Porky Pig dolls, predating a similar scene in the Tom & Jerry cartoon ‘The Night Before Christmas’ by eight months. There’s also a mechanical duck, which accounts for some gags that look all the way forward to the elaborate gags of Chuck Jones’s Roadrunner and Tom & Jerry cartoons. In ‘The Cat’s Canary’ we watch a cat swallowing a bird. Surprisingly the bird remains alive, and makes the cat produce chirping sounds. The cat goes to a doctor, to no avail, he then joins a quartet of alley cats serenading a kitten. He joins in chirping. But when he gets hit with a cage, the bird escapes. The bird takes revenge on the cat with help from some fellow birds, including a pelican. 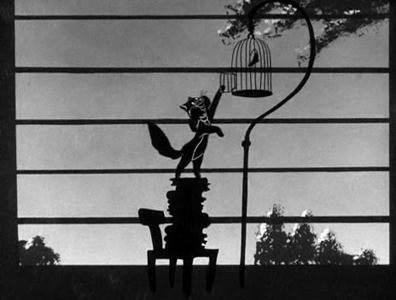 After watching such ambitious films by Van Beuren as ‘The Family Shoe‘, ‘Toy Time‘ and ‘Fly Frolic‘, the Aesop Fable ‘The Cat’s Canary’ feels pretty backward. The designs of the cat are highly inconsistent and primitive, looking back to the Waffles and Don films from 1930. The complete short lacks the Silly Symphony-like quality of the preceding Aesop Fables. Moreover, it’s storytelling is weak and inconsistent: there’s a complete throwaway scene, in which the cat is visited by sympathizing birds, and although the cat is the main protagonist throughout the whole film, he suddenly changes into a villain in the end. The final scene is clearly inspired by the finale of Disney’s ‘Birds of a Feather‘ (1931), and perhaps ‘The Bird Store‘ (1932), but it adds nothing of its own. ‘Any Little Girl That’s A Nice Little Girl’ is a Screen Song about a cat who’s dating several girls at the same time. First we watch him dating his girls through the telephone, then he goes through a bunch of photographs and chooses to visits hot Lulu Belle. When he tries to sneak out, Lulu Belle hits him with the couch. Enter the Screen Song, which is accompanied with images of e.g. a naked woman in a bath(!) and a picture of Betty Boop, who otherwise does not appear in this cartoon. Only the first scene features lip-synch, and the scene with Lulu Belle also features an excerpt from the 1929 hit song ‘What Wouldn’t I Do for That Man’, popularized by Annette Hanshaw and Ruth Etting. This excerpt is much more interesting than the 1910 vaudeville title song. The last chorus features some nice interplay between the words and the animated characters, typical for the Screen Songs of this era. ‘Early to Bet’ introduces the ‘gambling bug’, a bug that makes people want to gamble. 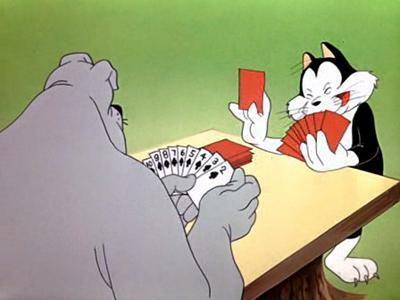 The little insect infects a cat who then starts to play gin rummy for penalties with an over-confident bulldog. The bulldog wins several times, and the cat has to pay the elaborate and rather zany, yet painful penalties. In the end, however, he plays against the bug, and wins, making the bug pay a penalty. Apart from the original and pretty funny penalties, this is a mediocre cartoon, which lacks stars or even appealing characters. At the San Juan Capistrano mission a cat is waiting for the swallows to return. Unfortunately, the swallows have sent a scout who is too clever for him. This cartoon contains of several blackout gags, and, unusual for a Robert McKimson cartoon, practically no dialogue. Actually, the cartoon is reminiscent of the silent blackout gag comedy of the Road Runner series, which were introduced only one month earlier. ‘Swallow The Leader’ may be atypical for McKimson, it’s well-directed,with the gags coming in fast and well-timed. The mission featured does really exists and is indeed famous for its nesting swallows. The cat is a typical McKimson design, and very reminiscent of the Supreem Cat in ‘Paying the Piper’ from earlier that year. Typically, he wears a collar, which makes him look like a forerunner of the standard Hanna-Barbera television studio design.